With ever evolving regulatory requirements, soaring operational expenses and diminishing client satisfaction financial institutions must start digitizing their KYC landscape – which can be realized through the implementation of Robotic Process Automation (RPA). 4. How it can be approached. 1. What are the drivers requiring the digitization of KYC processes? With rising and “scope broadening” regulatory requirements, an ever-increasing number of sectors and lists have to be screened against a financial institution’s clients’ names, counting millions of names, from ‘political persons’ to ‘state-owned companies’ to ‘dual-use materials’. At the same time, financial institutions are exposed to significant remediation costs and potential fines in case they fail to comply with the regulations in force. Between 2009 and 2015 for instance, the breach of US Financial Rules only had already imposed banks a total fine of $16.5 billion . Currently, 75%-85% of daily alerts are false positives while up to 25% are reviewed by level-two senior analysts. The alert review process is very time and cost intensive at an average cost of £20 per review, cumulating to a huge amount considering that a bank has millions of customers to screen . This leads financial institutions to the crucial dilemma between bearing the risk of huge penalties and the unbearable cost of manual alert investigations. Hence, the consequential challenge is to reduce this to a manageable number through moving the post-matching process towards further algorithmic process automation. With the enforcement of the 4th AML Directive  customers who have previously been considered as low-risk are now to be treated as potentially high-risk customers. As a result, obtaining products becomes a more time-consuming process since passports will have to be presented more frequently and a range of questions will have to be answered to meet the requirements for KYC identity verification. In conclusion, the onboarding process becomes lengthier, customers must respond to questions that might appear intrusive and costs increase. 2. 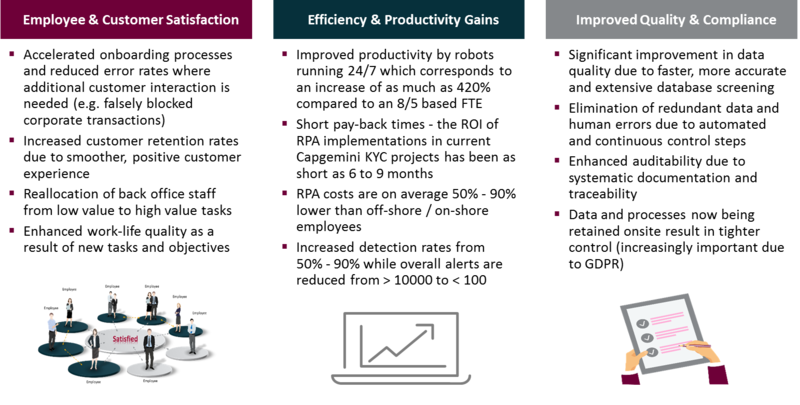 What makes RPA become a crucial success factor and competitive differentiator? The implementation of RPA embraces three dimensions which can be leveraged to release both qualitative and quantitative benefits affecting the long-term success of financial institutions’ core banking processes and client relationships. 3. For which processes can RPA be used to increase operational efficiency and compliance? 4. Which approach would suit the implementation of RPA for your KYC processes? Which stakeholders should be involved and aligned with upfront? Does the implementation of RPA and KYC target operating model fit the overall corporate strategy? And which (corporate) functions does it imply? Which KYC processes and functions should be automated, and which are most suitable to start with or should be prioritized? Are there enough internal resources to support the transformation process and what is the intensity of training required to adapt to the new target operating model? What is the amount of data cleansing needed prior to migration for existing clients and what is the status of the client relationship? What is the country business volume? And which country proves most suitable for a pilot / proof of concept (PoC)? Capgemini Consulting has established an agile approach to digitize KYC processes by leveraging client specific assets in combination with RPA KYC specific best practices. This article was written by Lea Krämer.